OK, I will admit, it is not the most attractive thing in the world is it. But this little buddy just so happens to be my go to snack when I need a 2nd breakfast on the weekend or just a bit of an energy pick me up in the afternoon. I made this for myself when I got off work early on Friday - I needed something to tie my over until dinner! Mix all but the banana in a bowl and make sure the ingredients are thoroughly combined. Then add the banana and check the consistency. You might want to add a little more milk if desired. Don't be afraid that this mix does not look like "normal" pancake mix. It shouldn't! Spoon the mixture into a frying pan and flip when ready. 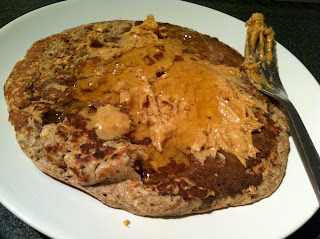 I like to top my pancakes with peanut butter and agave nectar but you can top with whatever you like. Cinnamon, lemon juice, fruit and low calorie sweetener etc. Whatever your heart desires! There are many many modifications that can be done to this recipe. You don't have to use banana if you don't want to - cottage cheese works well too.